Gated entry to Private lakefront property in Premium Peninsula locale. 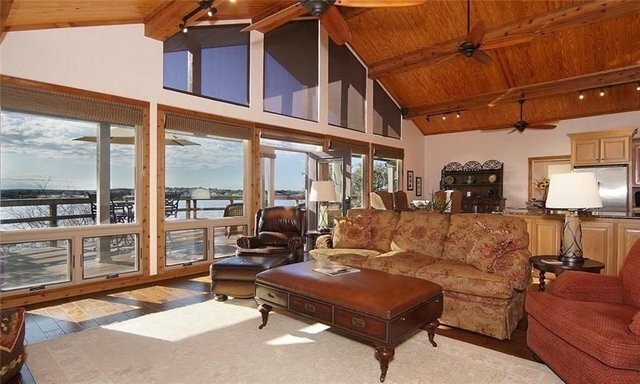 Bright and comfortable home with a Cottage Style Flair, just off the waters edge. Walls of windows offer plenty of natural light and stunning blue water vistas. Open Living and Kitchen design with Vaulted Wood Plank Ceilings and Handsome Stone Fireplace. Separate Master Suite. Three Guest rooms offer ample space for additional Friends and Family. Large lakeside Balcony as well as covered Rock patio and Bar seating with ample room for entertaining and relaxing. Tree lined rock walkway with gorgeous natural boulders to Deep water Two slip Dock with sea doo lift and upper sun deck complete the package. This won't last long!